Simon & Schuster, 9781416597285, 732pp. NO OTHER COUNTRY SO DOMINATES THE HEADLINES: Iran is portrayed as a nuclear threat, a terrorist nation, a charter member of the Axis of Evil bent on the destruction of Israel. But behind those headlines--and the fierce rhetoric of Iran's most hard-line leaders--is a proud nation with a 2,500-year history of Persian poetry, art, and passion. 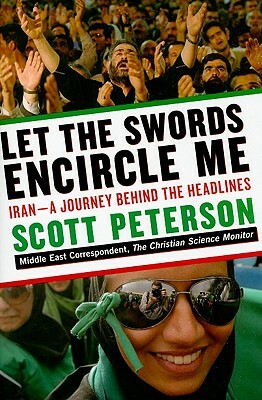 Based on more than thirty extended reporting trips to Iran, including the turbulent aftermath of the disputed June 2009 election, Scott Peterson's portrait is the definitive guide to this enigmatic nation, from the roots of its incendiary internal struggles to the rise and slide of Iran's earthshaking 1979 Islamic Revolution. This prize-winning American journalist with unparalleled experience in Iran takes us there, inside a country where an educated and young population is restlessly eager to take its place in the world; where martyrs of the "sacred" Iran-Iraq War are still mourned with tears of devotion; where the cultural and religious forces of light and darkness are locked in battle. Peterson brings stunningly alive the diversity within Iran--from the hard-liners who shout "Death to America" to the majority who comprise the most pro-American population in the Middle East. Let the Swords Encircle Me gives voice to Iranians themselves--the clerics and the reformers, the filmmakers and the journalists, the True Believers and their Westernized and profane brethren--to understand the complexities of Iran today. Through dedicated and in-depth reporting, Peterson shows how every word, image, and sensibility in Iran is often deliciously unexpected and counterintuitive. Ideology matters. So does "resistance." And azadi: freedom. Peterson deftly holds a mirror up to both sides of the U.S.-Iran conflict. Americans and Iranians, he writes, share a belief in their own exceptionalism and "manifest destiny" (which for Iran includes its nuclear ambitions) and frequent need of an "enemy" in political discourse. The same elements that have locked the United States and Iran in the most vicious of struggles--stretching back to the 1953 CIA coup in Tehran and the 1979 U.S. Embassy hostage saga--are the same ones that could one day make Iran and the United States the most "natural" allies in the region. In this critical and personal account, Peterson illumines the latest episodes of Iran's century-old quest for democracy and freedom. He explains how the Islamic Revolution--launched as a beacon of justice and resistance for Iranians and all the world's Muslims--has not lived up to its ambitious promise. He shows how the violence of 2009 damaged the regime's legitimacy and marks the start of an irreversible decline. Let the Swords Encircle Me takes us into the minds and hearts of Iranians today, and will be a crucial guide as Americans and Iranians attempt to overcome their bitter estrangement. Selected as one of the "Best Books of 2010" by Publishers Weekly: "A veteran reporter on the region brings us the best account we have of Iran—its rich history, artistic legacies, profound internal contradictions—in a copious, balanced, and readable narrative." "From sweaty political rallies in dusty provincial mosques, to vast cemeteries dedicated to Iran's war dead, from the tea and macaroons of government offices, to the private thoughts of a necessarily very private people, Peterson brings a living, breathing, all-too human Iran into the reader's hands, and one emerges with a sense of having gained intimate knowledge of, and compassion for, a place too often treated as inscrutable. "Nothing in these 600 pages is superfluous; all of it is fascinating." "There's a Tolstoyan panorama to Let the Swords Encircle Me that's likely to have readers checking the newspaper each day in a fever to find out what happens next."